This property caters for all guests alike. Once you have taken in the majestic views, relaxed in spa, alfresco entertaining on large deck (bbq supplied) you will not want to leave! This home captures all day sun, very warm and cosy. Heating consists of wall panels in main living area, queen and master bedroom. We have also supplied 2 oil column heaters to place throughout property as required. The large deck is fully enclosed so ideal for those families with toddlers, child friendly. An easy 2 minute walk to downtown Raglan to shops, cafes, pub (the hub). Smart TV, so easy to use with your apps on your phone. We have also provided Netflix, so you can access movies etc (an extra bonus!). Free wifi. Master bedroom bedding configuration is super king however bedding can also be 2 single beds, if preferred option. To access master bedroom you have the option of walking through queen bedroom or access outside either via ranch slider or at back of home under pergola (catering for all weather conditions). Master bedroom has ensuite with toilet, shower and vanity. *Pricing may vary depending on the dates you choose (based on time of the year ie summer/winter) and the number of guests. Our nightly rental is based on 2 persons only/night, an additional $30 applies to additional guests/night. Service fees relate to HomeAway fees (check your account for more detail on information relating to what is actually involved). * Not a party venue, please respect neighbours and noise levels to a minimum after 9pm. 5 night minimum booking applies over xmas/new year periods. Linen (optional), NZ$18.00 per person/stay. Please enquire within for more accurate quotation based on number of guests, as stated above. Hi I am acting property manager for this beautifully presented property and more than happy to accommodate a request you may have, we oblige by "going the extra mile". Fabulous sunny open plan living with SPA located on deck, easy walk to downtown Raglan shops, cafes, etc. Property located a mere 2min walk to Raglan township. Wall panel heaters plus additional 2 oil column heaters. Electric fan provided over summer months. $18/person/stay (optional), please enquire within for an accurate quotation based on number of guests. Smart TV with in-built chromecast. Freeview Channels. Some channels are specific to certain regions and only broadcast via UHF so the channels you'll get depend on where you live. LOCATION, LOCATION, LOCATION (this says it all) with magnificent views. Exactly what we wanted & more! Loved the views from the kitchen, living area & deck - better than the photos! The living areas were lovely, open and clean. Julls has been very helpful with great communication. Highly recommended! Have already booked again! Views to die for, close to town and spa to luxuriant in. Escape to another world as you watch the ever changing views in a well equipped and comfy bungalow. Memories made for the last 2 Christmases here. We loved our stay here, kitchen fully equipped for cooking our own meals. Conveniently located to the shops and local wharf. Easy walk to the footbridge and local playground where the kids can safely swim and play in the sand. Brilliant property, highly recommended. The agent was awesome to deal with. Awesome Bach! Amazing views! Comfy beds, spa is awesome! Everything you need. Great for our toddler too as deck is fully enclosed. Loved that it is only a short walk to town too. Can’t wait to go back! Really enjoyed the house and its location to town. It is on the main road , however that did not worry us and in October it was not noisy. 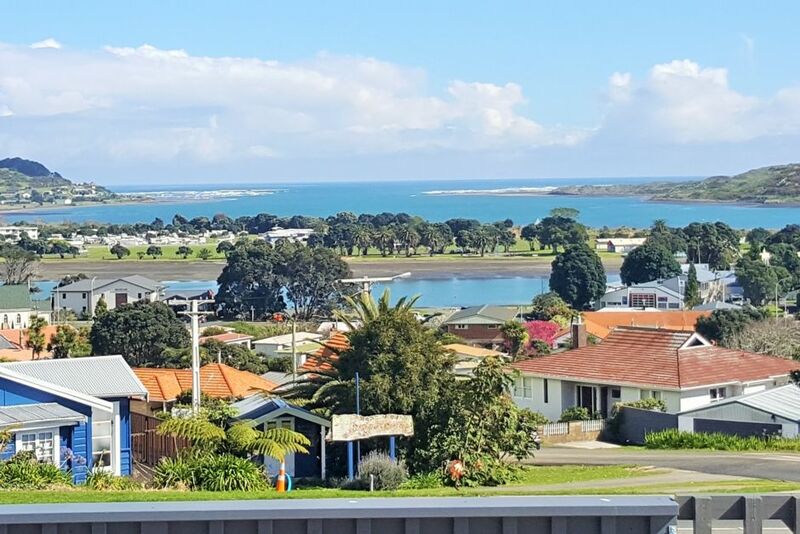 Bascially downtown Raglan, excellent location with views and spa!